The blood-type diet, a popular weight-loss plan developed by naturopathic physician Dr. Peter J. D’Adamo and detailed in his book, “Eat Right 4 Your Type,” is based on the idea that your blood type plays an important role in how your body absorbs nutrients and handles stress, as well as how susceptible you are to illness. 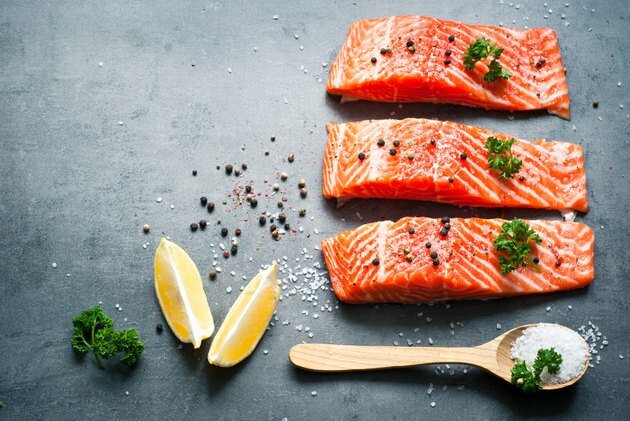 Dr. D’Adamo’s diet plan theorizes that the four main blood types -- O, A, B and AB -- are each linked to distinct ancestral groups with particular dietary patterns, and that adhering to the diet associated with your own blood type can help you lose weight and stay healthy. Scientific research has yet to find evidence that support this dietary theory, however. According to the blood-type diet plan, people with O type blood -- blood linked to the hunter-gatherer era -- thrive on a diet that’s high in animal proteins. Although the diet supplies an extensive list of foods that benefit O types, it specifically lists red meat and liver as foods that promote weight loss, and advises O types to eat lean beef, lamb and poultry, as well as lean and fatty fish, as often as desired. O types, according to D’Adamo, are more efficient at metabolizing animal proteins, because they tend to have higher levels of stomach acid. The diet also advises O types to consume plenty of the recommended vegetables; kelp, kale, spinach and broccoli are specifically cited for encouraging weight loss, while leeks, onions, garlic, sweet potatoes, turnips, parsnips and artichokes are also considered beneficial. The diet lists figs and plums – either fresh or dried – as the two main fruits that support weight loss in O types. The other half of the hunter-gatherer type-O diet is what it doesn’t contain; it’s mostly devoid of grain and dairy products. D’Adamo calls wheat products the primary cause of weight gain for O types, and recommends they avoid them completely. He theorizes that O types don’t tolerate wheat products well for a number of reasons; they interfere with the absorption of beneficial nutrients, promote inflammation and decrease insulin efficiency and metabolism. The diet advises O types to steer clear of corn, too; like wheat, it interferes with metabolism and insulin efficiency. O types should severely limit or completely avoid dairy products, including eggs, for similar reasons, since, according to D’Adamo, O types don’t digest dairy foods efficiently. The blood type diet also lists kidney beans, navy beans and lentils as foods that interfere with metabolism and promote weight gain in O types. Cabbage, Brussels sprouts, cauliflower and mustard greens are also said to encourage weight gain because they interfere with thyroid activity, and O types are prone to hypothyroidism. The O-type diet plan is designed to boost your metabolism; D’Adamo suggests that O types require a highly efficient metabolism to stay lean and energized. He also suggests that O types respond best to stress through strenuous physical activity. According to his theory, the hormones that flood your system when you’re under stress go straight to an O type’s muscles. Intense physical exercise can help O types release this buildup of hormones, which is directly related to their ability to lose weight and maintain weight loss. O types who are actively trying to lose weight aren’t likely to be successful without regularly participating in intense bouts of exercise, according to D’Adamo. He recommends that O types exercise at least four times a week, for an average of 30 to 60 minutes per session; suggested workouts include swimming, jogging, cycling, weight training, stair climbing, martial arts, contact sports, dancing and brisk walking. With any weight-loss plan, your dietary choices play a large part in determining whether or not you’re ultimately successful. Because the blood type diet emphasizes healthy foods and promotes physical activity -- in addition to discussing how to moderate food portions for calorie control -- it’s not surprising that it’s a successful weight-loss method. These benefits haven’t been scientifically proven to be related to blood type, though; according to a review published in the American Journal of Clinical Nutrition in 2013, more than 1,000 studies have been carried out on the blood type diet, and none have found evidence supporting the theory that specific blood types do best with specific diets. And while a 2014 study published in the peer-reviewed journal PLoS One did find that following the various blood type diets can help reduce BMI, waist circumference, blood pressure, cholesterol levels and triglycerides, researchers concluded that such results are independent of a person’s blood type.